"Ay Mere Chahne walo'n Allah se daro aur Hamare liye Zeenat ka Sabab Ban'o Apne Amaal'o' kirdar ke zariye Hamare Liye baays-e-Zillat na Bano. Ref: kafi v 2 pg 77. How can a thing the existence of which is dependent on you be taken as a proof for your existance? Is there anything more evident than your "self" disclose you? Are you hidden to need a guide to find you? Surely you are not. Are you far-away to need your footprints to find you? Surely you are not! 2 - He who has you has everything, and he who has deprived himself of you is the poorest in the world. Loser is the one who chooses and be content with anyone or anything other than you. 3 - Never will be salvaged the people who win the consent of the creature at the cost of the dissatisfaction of the creator. 4 - No one will feel secured on the Resurrection Day except those who feared God in this world.
" The believing men and the believing women, they are guardians of each other, enjoin good and forbid evil..."
of the oppressed and opposes tyrants. 6 - O' people, the Messenger of God said : Whoever sees an aggressive tyrant legalizes the forbidden of God, breeches divine laws, opposes the tradition of the Prophet, oppresses the worshippers of God, but does not concede his opposition to God in word or indeed, surely Allah will place that tyrant (in the Hell ) where he deserves. 7 - People are slaves to the world, and as long as they live favorable and comfortable lives, they are loyal to religious principles. However, at hard times, the times of trials, true religious people are scarce. 8 - One who pursues a goal through sinful ways, will ironically distance himself from that goal, and will approach what he was afraid of. 9 - Don't you see that the right is not conveyed and the wrong is not prohibited. Let believers wish to die and righteously meet their God. 10 - To me, death is nothing but happiness, and living under tyrants nothing but living in a hell. (These difficulties are) because administering the affairs of the society and conveying the (religious) rules must be done by scholars who truly believe in God and know what is permitted and what is forbidden by God. But you were deprived from this position and rank for you withdrew from (supporting) the truth. You changed the tradition of the prophet,despite the clear and disclosed proofs. If you had withstood and were patient against the torture and annoyance (of the tyrants) for the sake of God, then the divine affairs would have stayed in your hands, and you were the ones to whom would be referred. But you made the tyrants dominant on you and left the divine affairs in their hands, while they shamelessly do the forbidden and notoriously live a licentious life. Your (fear) from death and attachment to this world have encouraged the tyrants to establish dominance over you. 12 - O' God! Surely you know that whatever we did was not a competition to gain worldly positions and not for the worthless physical attractions of the world. But to show the signs of religious ways and to remove corruption from your lands, so that the oppressed feel secured and act according to your traditions and rules. 13 - I never revolted in vain, as a rebel or as a tyrant, but I rose seeking reformation for the nation of my grandfather Mohammad. I intend to enjoin good and forbid evil, to act according to the traditions of my grandfather, and my father Ali Ibn Abi-Talib. 14 - If the world is counted valuable; surely the house of God's rewards is higher and more worthy. If bodies were created for death; surely being killed with swords in the way of God is a more honorable death. If the share of daily sustenance, of each creature is provided by the creator, surely it is not descent for man to be greedy for gaining and eating too much. If wealth is amassed for one day to be left. Then why a free man becomes so miser on something he has to leave. 15 - If you don't believe in any religion and don't fear the Resurrection Day, at least be free in this world. 16 - Those who worship God for the hope of gaining, they're not real worshippers, they're merchants. Those who worship God out of fear (of punishment), they're slaves. And those who worship God to be grateful towards their creator, they are the free people, and their worship is a real one. 17 - Beware that the need of people to you is among the blessings of God to you. So do not scare away the needy people when they come to you, as the God's blessings will return and go elsewhere. “Why do Jewish scholars not prohibit their people from saying sinful words?" "Certainly evil was that which they did. " Surely the God criticized them for they turned a blind eye to what they saw of evil and corruption from the tyrants of their time out of greed or fear. 19 - Whoever seeks the satisfaction of people through disobedience of God; Then God subjects him to people. 20 - Avoid oppressing the one who does not have any supporter against you, other than the Almighty God. 21 - One who reveals your faults to you like a mirror is your true friend, and one who flatters you and covers up your faults is your enemy. 22 - Wisdom will not be complete except by following the truth. 23 - Associating with corrupt people makes you subject to suspicion. 24 - Crying out of fear from God is salvation from the hellfire. 25 - A man came to Imam Hussein (Master of the martyrs) and said: I am a sinful man and can't avoid doing sin, please advise me. Imam (PBUH) said: If you can do these five things, then commit sin as much you like. First of all: don't eat the sustenance of God and commit sin as much you like. Second: go beyond the domain of God and commit sin as much you like. Third: seek a site where God cannot observe you and commit sin as much you like. Fourth: if the Angel of death comes to you to take away your soul, expel him away from yourself and commit sin as much you like. Fifth: If the Angel of Hell was about to throw you into the hell-fire, stop him and commit sin as much you like. 26 - Avoid doing what makes you obliged to apologize for it. True believers never do anything for which they have to apologize. Fake believers, on the contrary, keep doing wrong and say they are sorry in the after math. 27 - Hastiness is foolishness. 28 - Do not permit anybody (to come in) before saying Salam (greetings). 29 - Among the signs of ignorance is arguing with irrational people. 30 - Among the signs of a learned man is criticizing his own words and being informed of various viewpoints. over me, the hell-fire in front of me, death is looking for me, there is no escape of the Day of Judgment, I am taken as a hostage by my own deeds, things do not turn out to be the way I like, I cannot repel what I hate, the affairs are in someone else's hands. He tortures me if he likes and he forgives if he wishes. Therefore, is there anybody poorer than me? 33 - The most generous person is the one who offers help to those who do not expect him to help. 34 - Whoever sorts out a problem of a believer, God sorts out his difficulties of this world and the here-after. 35 - If you heard a person discredits the dignity and the honor of people, then try not to get introduced to him. 36 - Never raise your need except to three (kinds of people): to a religious, to a brave man or to a nobleman. 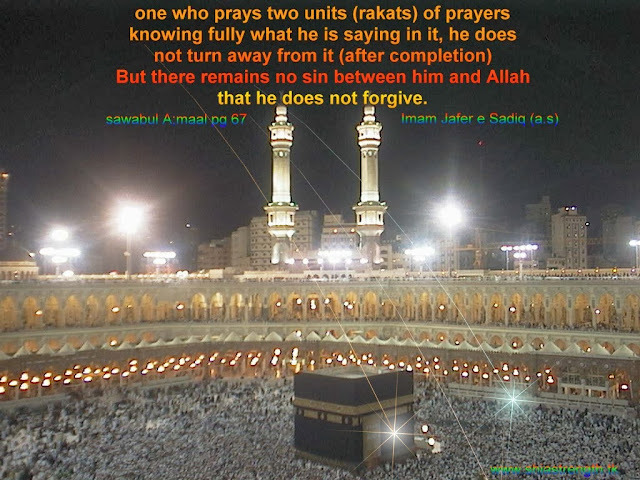 37 - Seventy rewards are for Salam (Islamic greeting ) ; sixty nine for the starter and one for the one who replies. 38 - Act like the one who believes in punishment for sin and reward for good deeds. 39 - Should poverty, illness, and death not exist, man would not bow to anything. 40 - You deserve the Paradise, don't sell yourself for anything less. Whoever is content to the worldly pleasures, has sufficed to something base and low.